Built at Kagoshima University, KSAT2 is a 1U, 1.5-Kilogram CubeSat that is set for a mission combining scientific and outreach objectives. The 1U satellite features the standard CubeSat design with body-mounted solar panels & two deployable paddles, nickel hydride batteries and a Power Control Unit making up the Electrical Power System. KSAT2 also uses Maximum Power Point Tracking (MPPT) to optimize solar panel output. The heart of the satellite is the Satellite Control Unit that regulates all functions including active attitude control that uses a sensor suite to determine satellite orientation and magnetic torquers to actively control its orientation. The communications system of the satellite includes two redundant Ku-Band transmitters that reach high data rates of up to 1Mbps as well as one S-Band transmitter used to downlink data at a rate of 200kbps. Uplink is either accomplished in S-Band or UHF both achieving a data rate of 1kbps. KSAT2 is outfitted with a high resolution camera for downlink of Earth images made possible through the high-speed Ku-Band link. Also, the satellite is outfitted with a deployable boom for attitude control and to host experiments. The spacecraft will test an original observation method for atmospheric water vapor for use in the measurement and forecasting of rainfall. 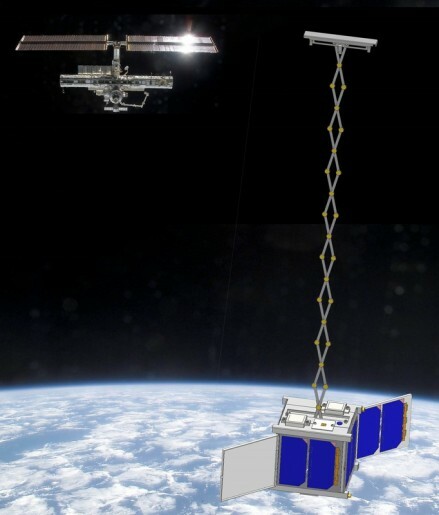 Basic experiments for LEO positioning of satellites will be performed by synchronizing the frequency and phase between a ground-based system and the satellite. Using a radio-interferometer, KSAT2 will demonstrate precise orbit determination for CubeSats in very low orbits. Tracking data will also contribute to density measurements of the upper atmosphere. As an outreach activity, the satellite will be used to downlink messages and photos from and for Japanese children.